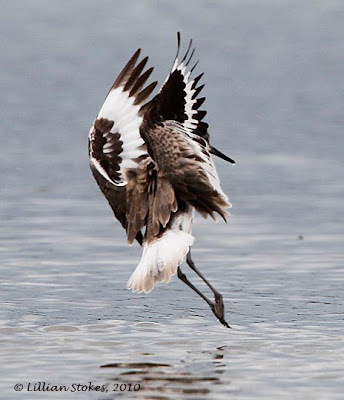 Yesterday I was photographing Willets as they came in to land on a sand bar at DinG Darling NWR. Here's one of my favorite shots. I love the way there is just one drop of water on the tip of the bill. Willets are a plain, gray, large, common shorebird. Unexciting until they open their wings, then wow! 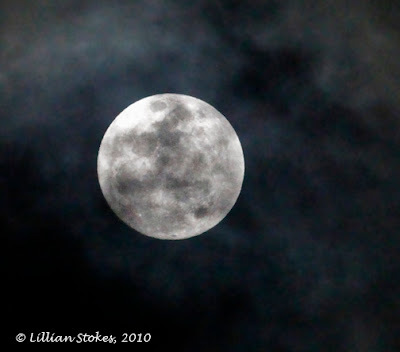 Moon last night, photo with noise reduction in photoshop. This, and next two photos, as is. 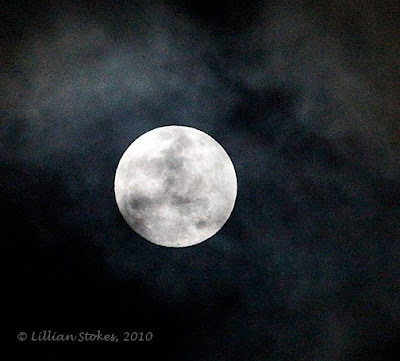 I just photographed the full moon here on Sanibel. The clouds kept blowing over it like smoke. All shot with the Canon 1D Mark IV at 12,800 ISO, hand held, with a 300mm lens. The top photo was run through photoshop for noise reduction and some low lights brought up. The other photos are, as is, out of the camera. Since I was shooting RAW plus .jpeg, these are the .jpegs. Of course, these are just experimental and pushing the camera to see what it can do at 12,800 ISO hand held. So, yes, I know they have noise. 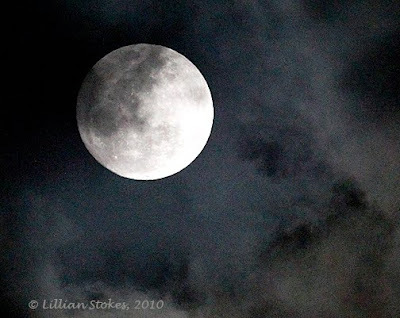 I could have used a tripod and different camera settings, and gotten less grain, etc. but in this case, I was just experimenting for fun. 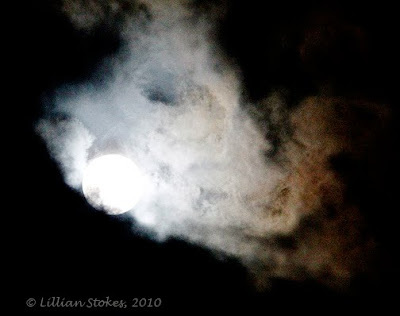 I have other photos from the past, with tripod, of the moon, done differently. I will continue to experiment. My Canon 1D Mark IV also takes movies, as I learned today. I read the manual and just discovered how to use the movie function, when it began raining, so I only took this quick video. There's a White Ibis preening, standing tall among the Willets. There's also a Black-bellied Plover stage front left. I can tell I'm going to have a lot of fun with this. How good is my new Canon 1D Mark IV? I'm just beginning to discover it. The Mark IV goes up to 12,800 ISO and actually even beyond, expanded to 102,400 ISO. So last night I went outside to shoot the palm trees with the moon. I hand held the camera with a 28-135 mm lens. The above photos were shot at 12,800 ISO, f/5.6, 30 mm, 1.3 sec. In the top two photos I only slightly brought up the highlights. In the bottom photo I did nothing. 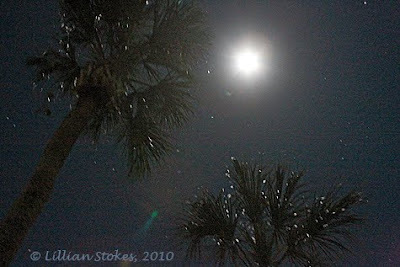 These photos only begin to capture the magic of night on Sanibel. 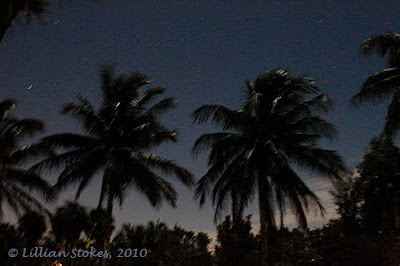 Coconut Palms are silhouetted against the horizon and their fronds sparkle with moonlight. 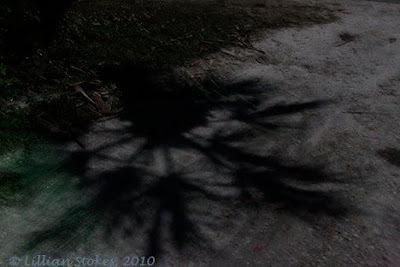 The bottom photo is of a moon shadow of a Sabal Palm on the sandy road. When we used to own an house on Sanibel, one of our favorite times was going out at night on our sandy road and walking through the moon shadows, the panorama of a sparkling, starry universe over our heads. I just got an incredible new camera, the Canon 1D Mark IV. Yeah! 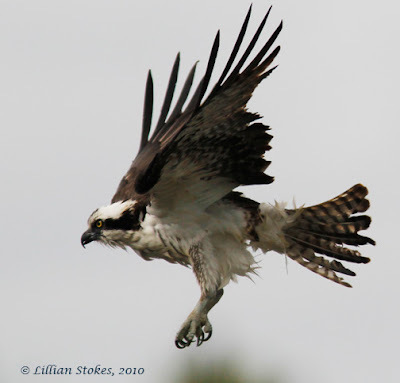 Here's one of the first photos I took with it today, of an Osprey in flight in a strong wind. There were two, and a Willet walking in front. 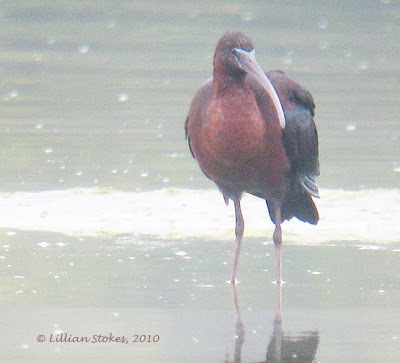 We saw some Glossy Ibis on Dinkin Bayou 2 days ago. They were waaay out on a mudflat, too far for my usual camera with telephoto lens, so I digiscoped them. Oh, and did I mention there was thick fog? I like to push the limits of digiscoping, sometimes just to get a photo unattainable any other way. 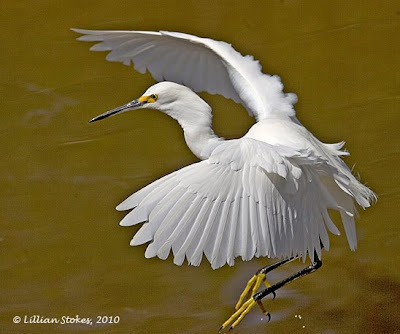 Most digiscoped photos you will see, will be of much closer birds in nice, bright light, hence gorgeous photos. But this was fun, and I like to experiment and see just what will happen when I try something novel. So I did and got a two-fer. 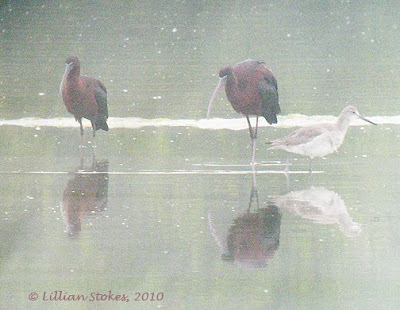 First , Glossy Ibis is a rare bird on Sanibel, which has tons of its relative, the White Ibis. So I wanted to document this. Secondly, I like the misty, painterly quality to these photos, so unusual. The mist, the distance, the shallow depth of field of a digiscoped image, all contribute to the mood of the photos. Makes me think about where the line of bird art exists between the world of the digital, and the hand of the artist. 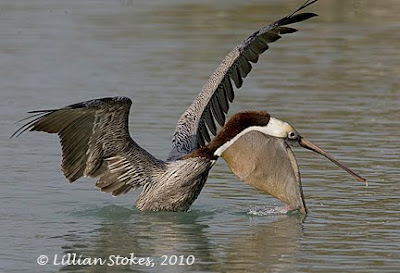 Brown Pelican, about to catch a fish this morning right in front of our cabin. but not the photographers (like me) who were lined up to catch some of their feeding antics and got some amazing shots. being careful not to step on the heads of their sleeping cohorts. So many photo ops, so little blog space, I have so many photos from just today! Wow, I didn't know what the inside of their mouth looked like. 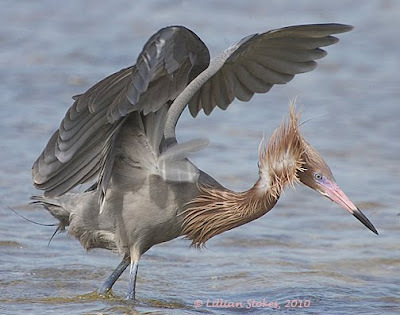 They sweep the big spoon-shaped bill back and forth in the water and snap it closed on a fish located by touch. Look at the ridges inside the bill, maybe helping hold the fish, or keeping the fish from escaping. This one is preening, but I noticed the silver ban on the rightt leg and the red band on the upper left leg. Put on by scientists who study their distribution and movements. Synchrony. Much of the flock was doing the same things at the same time. 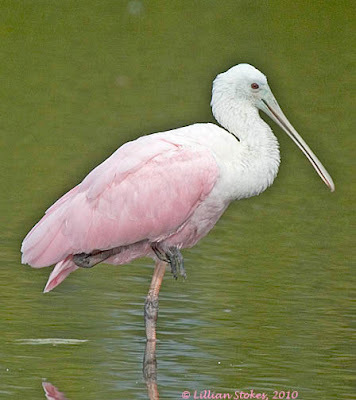 This is a first year bird, notice the white feathered head and pale pink wings. 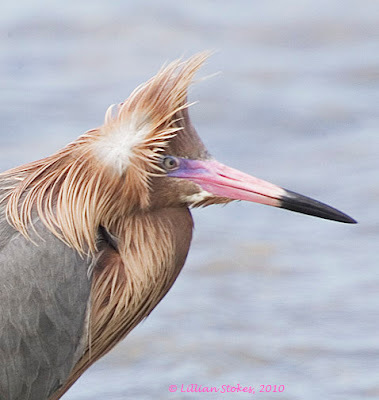 It takes 2 years to reach adult plumage. After resting and preening, they took off and went to feed. 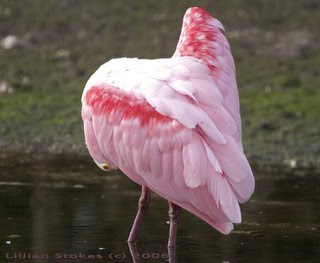 Looks like a big pink "M."
Today at Ding Darling there were over 50 Roseate Spoonbills in the first pond, quite an impressive number. 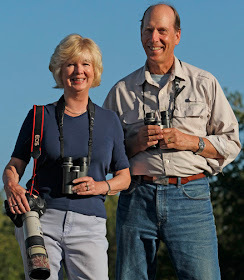 And they were fairly close to the road, thrilling the birders and photographers who lined up to watch and snap. 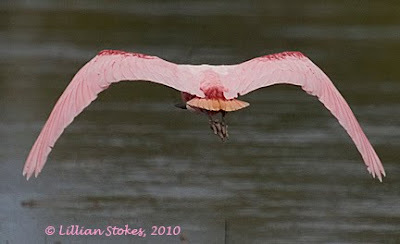 They were doing just about all the things Roseate Spoonbills do. Quite a show! 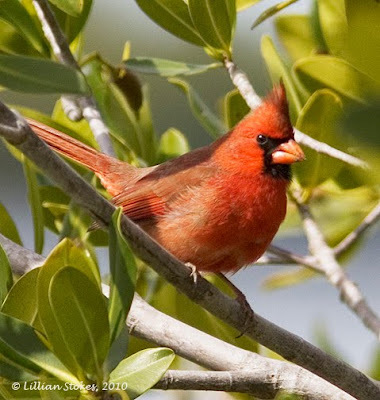 Cardinals are featured today on our "Feeder Friday" blog post. We're in southern FL where we saw a Northern Cardinal at Ding Darling NWR, Sanibel, FL, hanging out in the mangroves at the side of the drive. This always surprises us, we just don't associate cardinals being at the edge of a saltwater environment in mangroves. But there are plenty of cardinals here, and inland as well. There actually are 4 different subspecies of cardinals in different areas of the country. 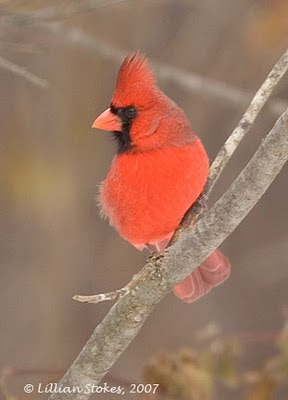 Even though the ones here and in NH are the same subspecies (Cardinalis cardinalis), the ones down here can give a much softer, sweeter, higher-pitched, "chip" note as part of their vocalizations, than the ones in our NH yard. It sounds more like a warbler chip-note and can be confusing to people who are down here looking for warblers. People always want to know how to attract cardinals to their feeders. We have found that cardinals at our NH home prefer platform, hopper, or feeders with wide ledges, filled with sunflower or a seed blend with lots of sunflower. Often they just go to the ground to pick up dropped seed. Our NH cardinals do not like to go to tube feeders. In FL, however, we had cardinals happily using tube feeders. What kind of feeders do your cardinals prefer and what kind of seed? 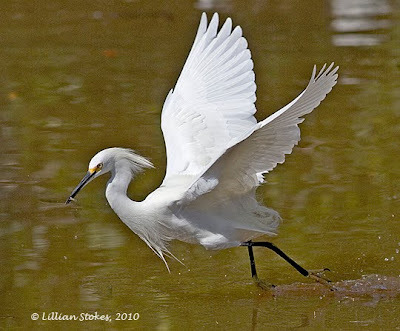 Yesterday at Ding Darling there was a feeding frenzy with Snowy Egrets doing amazing behavior. 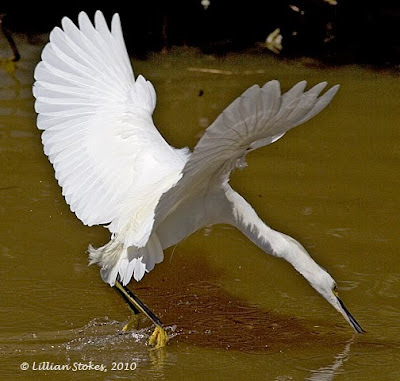 Small fish were concentrated in a muddy ditch beside the road and scores of herons were there trying to feed on them. 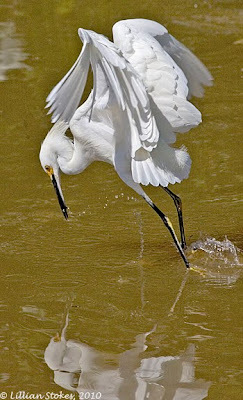 The Snowy Egrets had an astounding feeding technique. 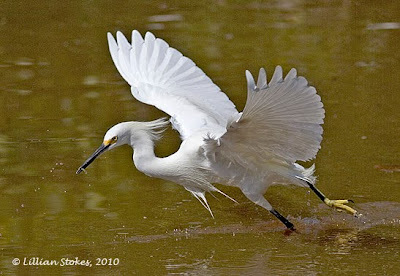 They would fly across the ditch while dragging their feet, possibly to scare up the fish, or even as a way of slowing their speed, so they could reach down and grab a fish. My photos capture all of this, complete with seeing a Snowy with its prize — a tiny fish, in its bill. 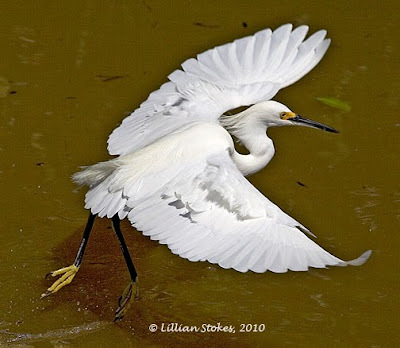 This all took place mid-day in bright sun, a photographic challenge to capture a white bird and still show the detail in the wings with no burn-out of overexposure. So I used a compensation of minus 2 2/3 to retail the detail in the wings. 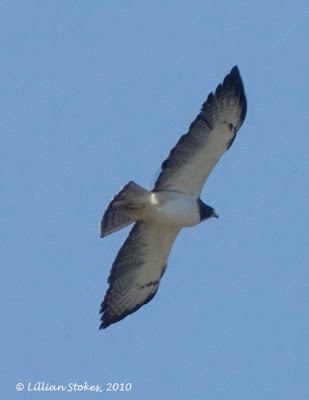 Most photos shot at f/10, 1/2500, ISO 200 and a 300mm lens with Canon 1D Mark II body. 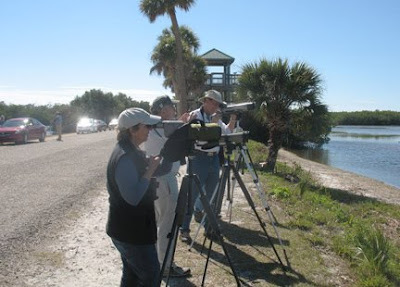 One of the great things about birding Ding Darling NWR in Sanibel, FL is seeing cool birds and meeting cool birders. Today we did both. 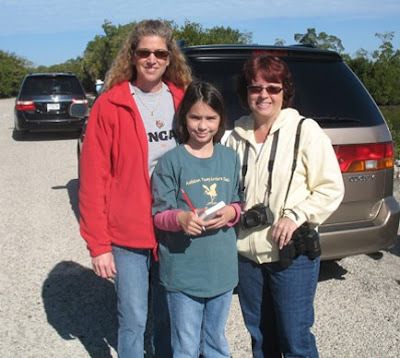 We met members of the Audubon Young Birders Club from Collier County Audubon Society. Martha Kriek, on the right, a 3rd grade teacher who encouraged lots of the kids learn about birds, said these children are the ones who will take care of these birds in the future. What an important concept! It is so critical that we teach kids to understand, love and respect birds now, since they are the conservationists of tomorrow. We applaud adults who are involved with this. 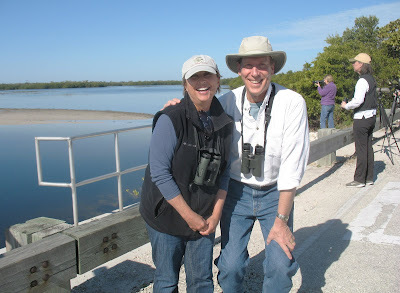 Don with another birder we met today, Gayle Sheets of the Caloosa Bird Club, who is involved with Lee County Bird Patrol (birdpatrol.org). 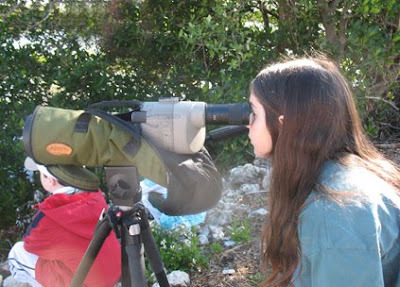 That is an organization in which volunteer birders routinely census birds on Lee County parks and "Conservation 20/20" properties and turn their findings in to the managers of those properties. 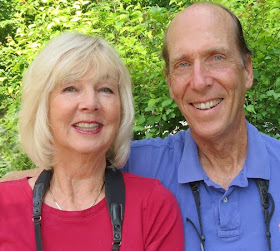 These volunteers are "dedicated to protect, monitor, observe and educate the public regarding the contribution that birds make to the delicate balance of the ecosystems" in those properties. What a great idea and model for other bird clubs! 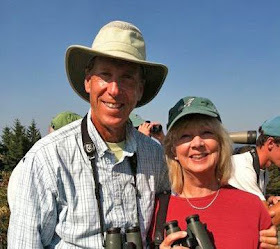 Don with Gayle and Harold looking out over the tower pond at Ding Darling, then Don spotted the Short-tailed Hawk. I was thrilled it came right over our heads and I had my cameras ready. 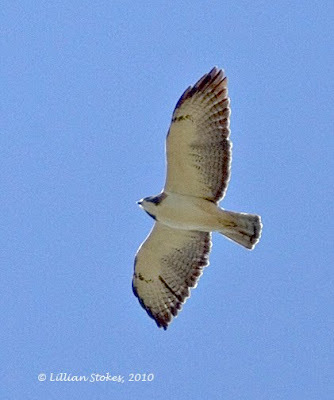 The Short-tailed Hawk is a rare finding on Sanibel. 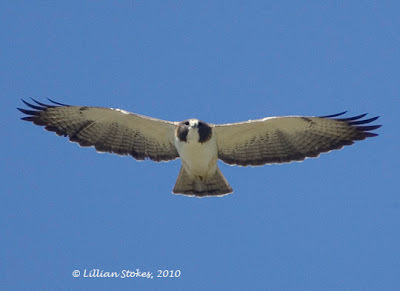 This hawk is found in FL and from central Mexico to Panama. It occurs in two color morphs. 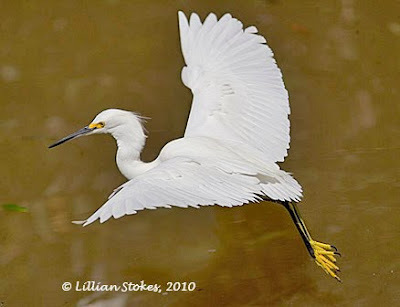 This bird I photographed is the light morph, and is white below. 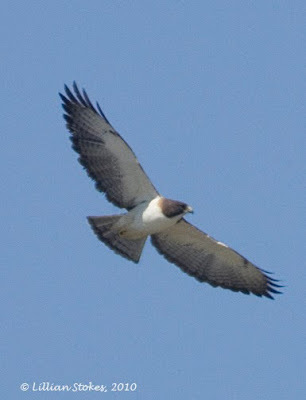 The dark morph is blackish-brown above and below with barred tail and flight feathers. Happy Valentine's Day everyone! Here are some Valentine's Day images from us. 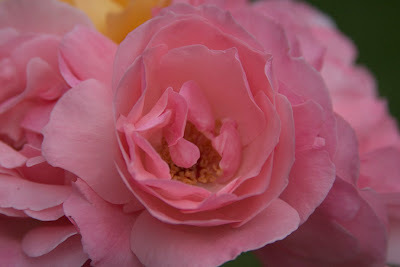 The top photo is of Bonica Roses from our extensive bird gardens at Bobolink Farm our 48 acre NH home. 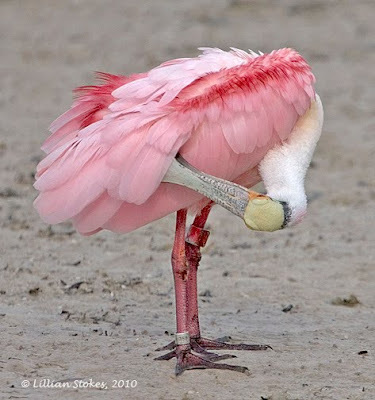 The second photo is of a preening Roseate Spoonbill (pronounced rose-ee-et) that looks like a big Valentine's day heart. It has it's right wing raised and is preening it's belly so you can't see its head, only its eye is visible peeking out from its left side. 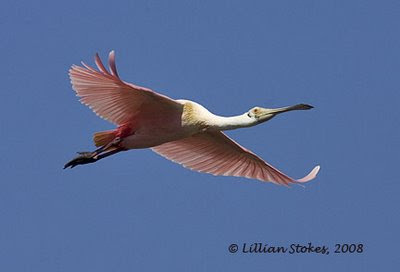 Spoonbills are one of the celebrity birds here at Ding Darling NWR, Sanibel, FL. 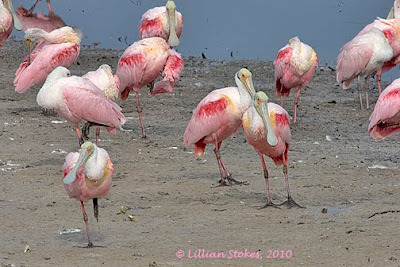 They are not flamingos, as many tourists assume because of their pink color. 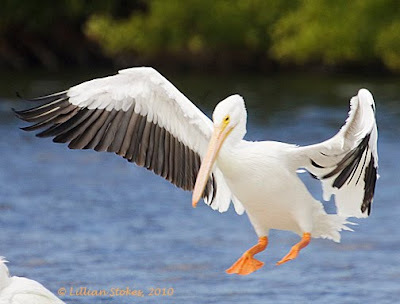 Below is a photo of one in flight. 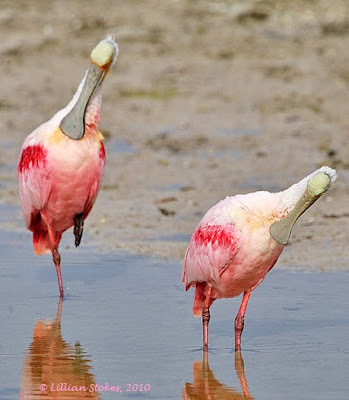 Roseate Spoonbills feed by sweeping the spoon-shaped bill back and forth in the water, then snapping it closed on a fish they locate by touch. This is also our 4 year blogger anniversary. 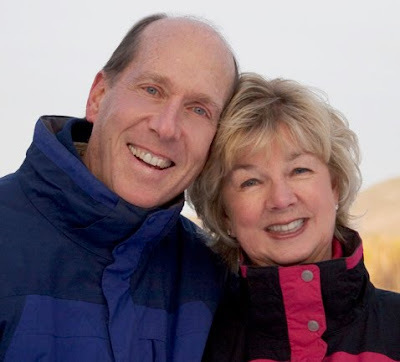 Lillian has primarily been writing this blog, and providing all the photos, and done 799 posts. 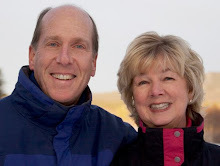 The blog has been viewed by hundreds of thousands of people. We hope you enjoy it. It's the Great Backyard Bird Count. 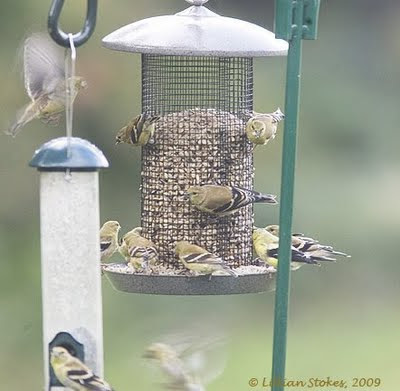 Time to count the birds at your feeders and in your backyard. Get involved! 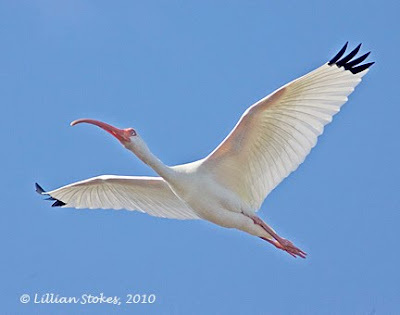 Photographed this White Ibis a few days ago at Ding Darling NWR. 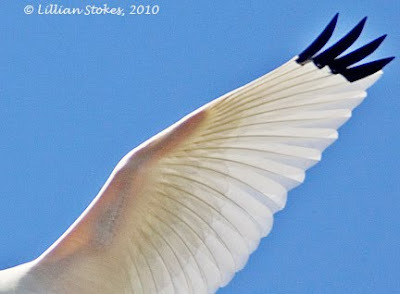 When I looked at the photos I noticed you could see the wing bones in the wing, as the wing was lit above by the sun. Wow! 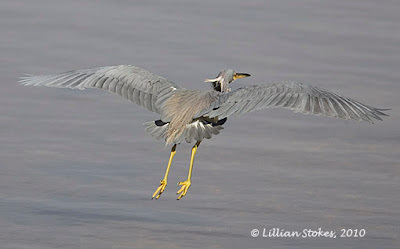 Tricolored Heron at moment of take-off. Looks like its levitating! At Ding Darling NWF. So many photos ops, so little time. 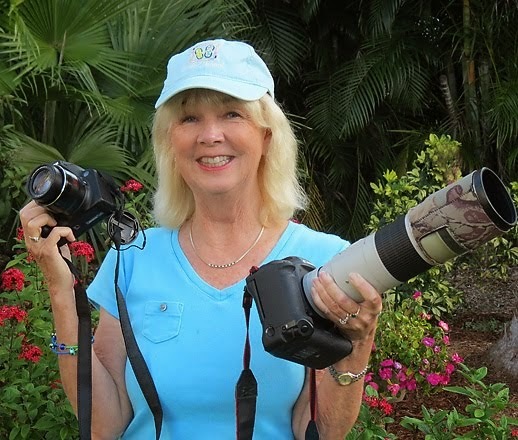 The two things we like best about Sanibel in winter are the great birding and photography opportunities, (especially at Ding Darling NWR), and meeting other birders. 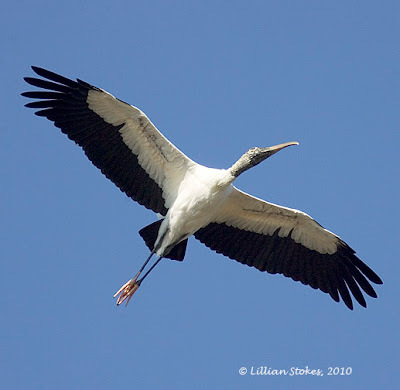 Here's a Wood Stork in flight photo I took yesterday. Someone standing near me said "how can they be so pretty in flight, and so ugly close-up?" 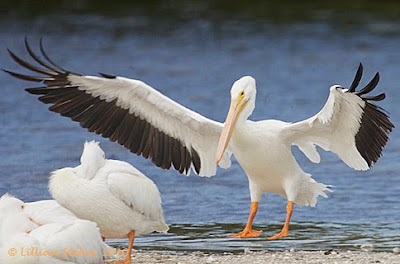 Well they are spectacular in flight, with those majestic white wings lined in black and pretty-in-pink feet. There are an unusually large number of Wood Storks that we are seeing at Ding and around Sanibel. That's a good sign, since they are listed as an endangered species in Florida. 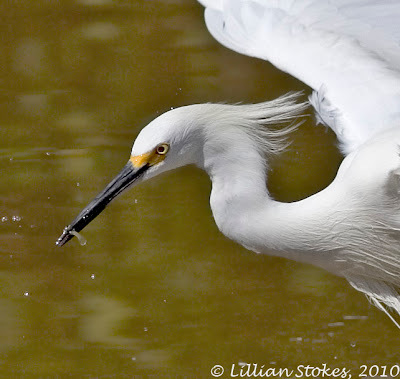 Wood Storks feed in shallow water on small fish they find by touch, then snap up with their bill. 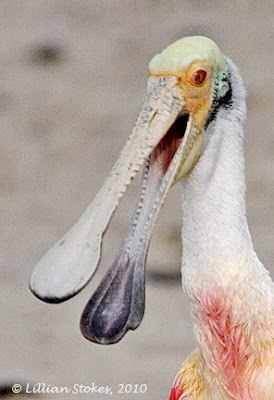 They're mainly a tropical and subtropical species and the only stork species that breeds in North America. Hi Polly, Ann and Lynne! 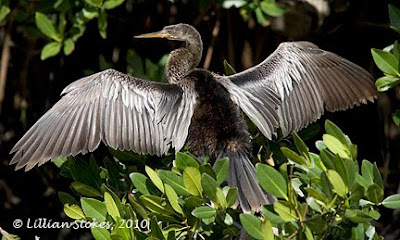 We went to another birding location on Sanibel called Sanibel Gardens, because there were reports of a Smooth-billed Ani being seen there. 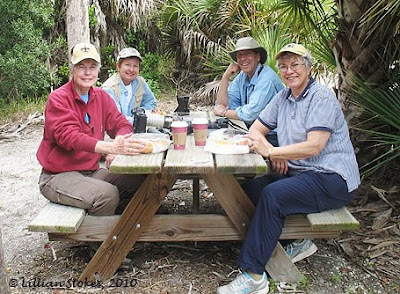 We didn't find an Ani but when we came out the path these fun birding ladies called us over. 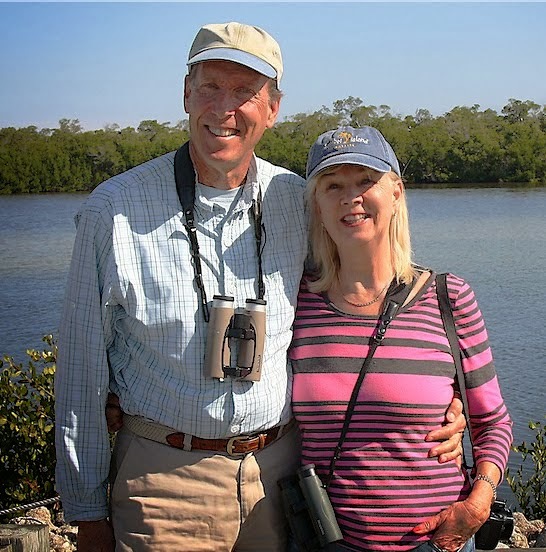 They had just had a good time at the Space Coast Birding Festival in Titusville and now were birding on Sanibel. 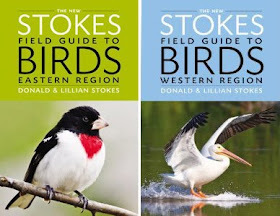 We loved that one of them had a very worn, underlined copy of our Stokes Beginner's Guide to Shorebirds that she said had helped her very much learn shorebirds. 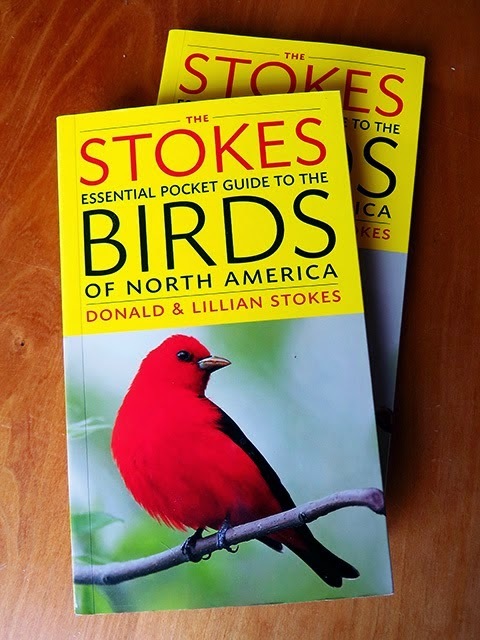 We told them about our new Stokes Field Guide To Birds of North America, which is coming out this year. We had a great time talking with them. To get on the mailing list to be informed when our field guide is coming out, send us your email address, click here.